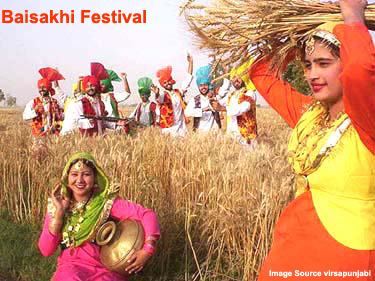 Baisakhi is a Sikh religious festival; it is celebrated in Punjab on the first of Baisakh which marks the beginning of New Year in the northern part of India. Corresponds to the first day of the Nanaksahi calendar and is usually on April 13. It is a harvest festival of Punjab. On this day in 1699, the 10th Guru, Guru Govind Singh ji established the Khalsa at Anandpur Sahib. With the Khalsa the Sikhs had a code of conduct to live by. The day sees devotees line up humbly and tirelessly before Gurdwarasw with offerings. People reflect on the values taught to them by the gurus and celebrate the birth of the Khalsa. In Punjab celebrations are centered around Talwandi Sabo – where Guru Gobind Singh stayed and completed the recompilation of the Guru Granth Sahib, and in the gurdwara at Anandpur Sahib, the birth place of Khalsa and of course at the Golden Temple in Amritsar. Across the border in Pakistan festivities are centered on the Panja Sahib complex in Hassan Abdal, numerous shrines in Nanakana Sahib, and in various historical sites in Lahore. Traditional folk dances of Punjab, called the Gidda and Bhangra, are performed. Prayers are offered to the Guru Granth Sahib, ‘Amrit’ is prepared as the Guru did and Kara Prasad is offered – followed by the devotees trooping to the community dining hall – Guru ka Langar. 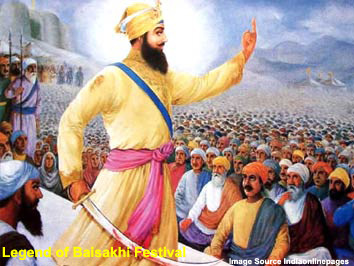 Vaisakhi or Baisakhi Festival is celebrated on Thursday, April 14, 2011.